How to Backup Windows 8/8.1 Operating System (OS)? Backup Windows 8 operating system (OS drive) enables you to prevent a lot of troubles. However, Windows 8 or 8.1 snap-in backup tool has many limitations. Thus, AOMEI Backupper can help a lot. Should We Backup Windows 8/8.1 Operating System? Should we backup Windows 8/8.1 operating system? Definitely yes! Backup Windows OS after installing the system is necessary. No matter Windows 8/8.1 or Windows XP/Vista/7/10, backup system can solve many problems. We all know that the computer may get in troubles because of many effects, such as virus attacks, hard drive broken, human’s wrong operations, etc. Many accidents can result in system crash. Once the system down, your computer cannot boot, the information may lose, the data may broke. That would be a big damage to users. However, if you backed it up before, you can restore Windows 8 image to SSD or HDD in a few minutes, and it will save the installing time and recover system information. Windows 8 and 8.1 OS can use its own backup tool to create a system backup image. 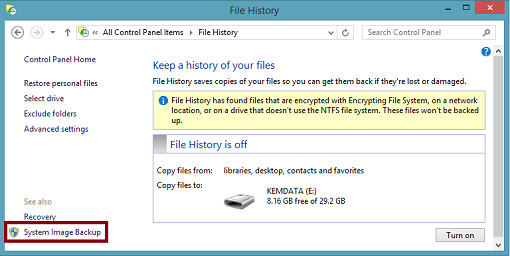 File History is the new features for backing up Windows 8/8.1. If you installed Windows 8.1, you can click Control panel > System&Security > File History to open it, and click “Turn on”. 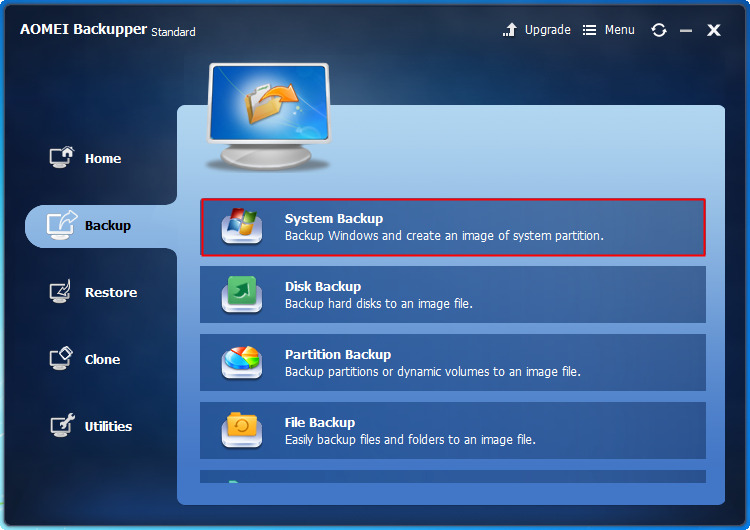 You can click “System Image Backup” at the lower left corner to create a system backup image. Windows 8 operating system still installs Windows System Backup. Click Start button-> Control panel->Windows 7 File Recovery. Click “Set up backup” to open the Windows System Backup. Although Windows8/8.1 snap-in tool can create system backup, it still has many limitations. For example, it can only create backup system image, and the operations are very complicated. What’s the good news is the third party backup software AOMEI Backupper can create backup image more flexible. How to Backup Windows 8/8.1 Operating System with AOMEI Backupper? As we mentioned above, backup Windows 8/8.1 operating system with AOMEI Backupper can solve more questions in a few steps. AOMEI Backupper is designed by the famous company AOMEI Tech. 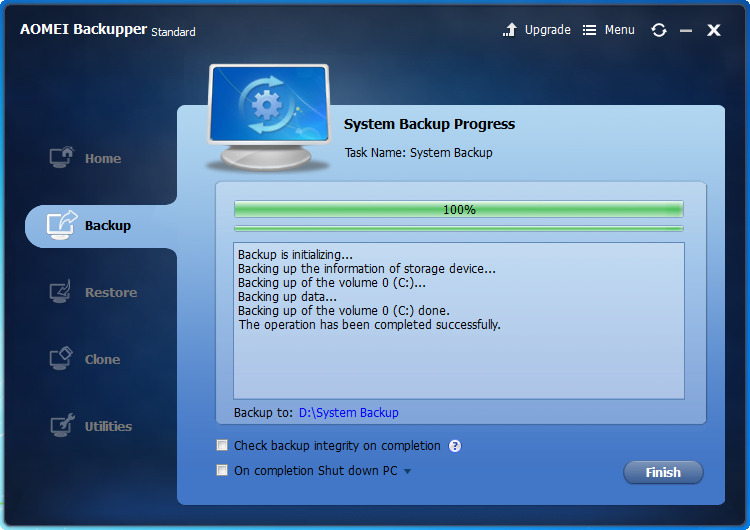 AOMEI Backupper is a great powerful backup software and it has many versions. For PC users, we highly recommend you AOMEI Backupper Standard, which can solve most of backup questions and you don’t have to pay for it. Just download at their official web site. While, how to backup system for Windows8/8.1 with AOMEI Backupper Standard? Here will guide you step by step. Step1. Install and launch AOMEI Backupper Standard. Open it and you can see the deep-blue interface of this software, click “Backup” to open the backup main interface. There are many backup types, select “System Backup”. Step2. You will move to the system backup window, the source partition has been selected by default, so you only need to select a destination place to store the backup image. You can choose a local space or an external hard drive, you can even backup to NAS. After this operating, you can click “Start Backup” to start proceeding. 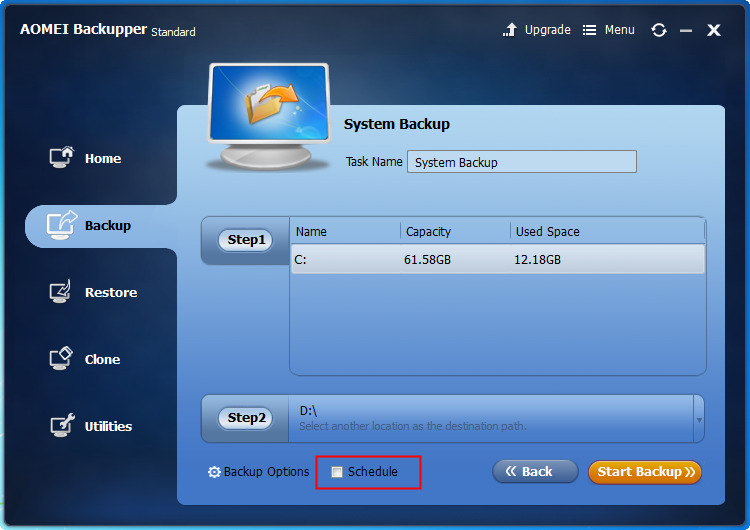 You can setup more backup details by click “Backup Options” and “Schedule” before clicking “Start Backup”. You can click “Backup Options” to add comments for the backup and set a password for it, and so on. The “Schedule” is for you to setup an automatic backup. You can click it to set a daily, weekly, monthly backup at the “General” tab, and set full, incremental, differential backup under “Advanced” tab. Step3. Wait a few minutes, after the progress reaches 100%, click Finish to end up this proceed. Creating system backup image for Windows 8/8.1 with AOMEI Backupper Standard is very easy and simple. This software’s friendly interface is easy-to-use that most people can operate alone.